8.3). Methionine can be activated by ATP to S-adenosylmethionine. This compound readily donates its methyl group to a wide variety of acceptors. The resulting compound, S-adenosylhomocysteine, is then hydrolysed to homocysteine and adenosine. Homocysteine is a key intermediate because it can be remethylated to methionine or can condense with serine to form cystathionine and then cysteine. An important feature of these conversions is that the conversion of homocysteine into cysteine is not reversible. 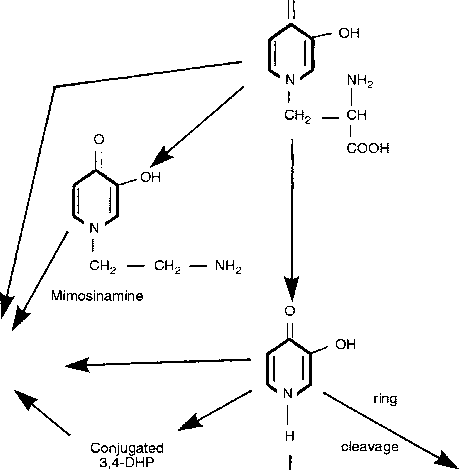 The net effect of these metabolic pathways is that methionine can be converted into cysteine, but cysteine cannot be converted into methionine. Several of the steps in the activated methyl cycle (in which methionine is demethylated to homocysteine and homocysteine is then remethylated to methionine) require B-vitamin coenzymes. Thus, there are important relationships between the sulphur amino acids and other nutrients.